Are you noticing that the 2017 Teachers Tournament group is not visibly diverse? Because I did. And am. I’m glad I got to be in it–so glad! And I’m grateful to have met these delightful people, whom I now consider friends. They are a kind group of dedicated educators representing different regions of the country (from Vermont, Arkansas, Wisconsin, New Mexico, Virginia, California, Texas, Michigan, Maryland), different communities (urban, suburban, rural) and schools that vary greatly in size, organization, and philosophy. We had, and continue to have, some wonderful conversations drawing on our varied backgrounds and experiences. I am not exaggerating when I say that in four years as a department chair, I have helped hire more faculty of color than I was taught by in my first thirteen years of education. I did not have a black teacher until college, when I had one (James Snead, of blessed memory). Why this is so is not simple. The linked article cites pay, working conditions, lack of autonomy to make changes to benefit students. Jeopardy! itself has become more visibly diverse since the days when Maya Angelou called out the program in 1995 for only rarely having Black contestants. Among the show’s most successful contestants of recent years are some who are African American or biracial. 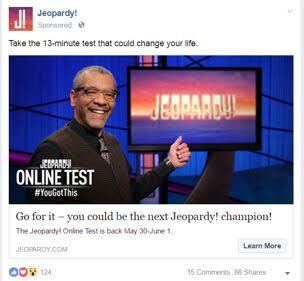 You may remember, for example, Teen Tournament semifinalist Brandon Saunders, who is currently on what looks like a campaign to conquer every game show in the U.S., or possibly the world; Matt Jackson, who has the fourth longest winning streak in Jeopardy! 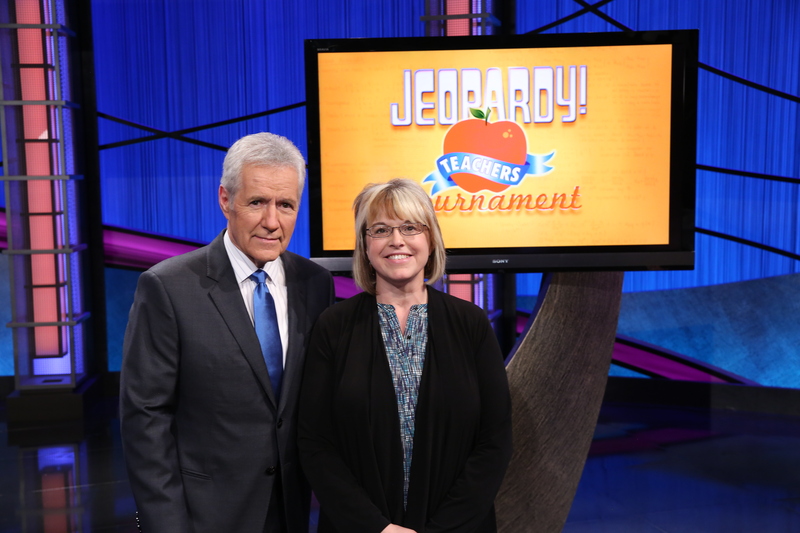 history and who told Alex Trebek, “My mother is white, liberal and Jewish, and my dad is black, Christian and conservative”; and, of course, Colby Burnett, the Chicago history teacher who is, so far, the only Teachers Tournament winner to also win the Tournament of Champions. And yet the group I auditioned with in Los Angeles, a city that is now almost half Latino or Hispanic, 10% Asian, and almost 10% Black or African American, appeared predominantly white and Asian. And it’s still a matter for comment when an African American or Latino contestant appears on the show, let alone wins. Particularly if she is a woman. One of Newton’s Laws of Physics say, essentially, objects will continue to do whatever they are doing until some force is applied to change that. I think the same is true of game show contestants. If minorities are underrepresented in the potential contestant pool, the show runners should seek them out, make sure they are in a position to audition successfully, even develop programs for young minority children to develop their knowledge base. And this is especially true for the Teachers Tournament. Why? Because the Teachers Tournament shows are by far the most likely to be watched by young people, the shows’ future contestants. And if Latino or African American or other minority students don’t see contestants who look like them, they will inevitably come to the conclusion that they don’t belong in that community. And the reverse is also true. In the same way that Barack Obama’s presidency was powerful for the simple fact that he existed, that African American students could watch TV every day for 8 years and see a black man in the Oval Office, they would inevitably conclude that this was possible for them as well. But, like Newton’s law, this is something that will not change on its own. It needs a force to make it change, and that force will have to come from the show’s producers. I love the way she frames this with Newton, don’t you? These aren’t things to be overcome by ourselves and within ourselves alone, even though some of us will be able to overcome them without much apparent help. If we want to nurture students’ interest in engineering, we create opportunities for kids to learn robotics and chances for them to cooperate with and compete against one another; if we want to send a synchronized swimming team to the Olympics, we find coaches, look for the talent, get the talent in the pool. I think this goes for teachers–a profession for which, in this country, we do very little to cultivate and nurture talent–and for Jeopardy! contestants as well. We held the viewing party in the library at school and I cannot think of one thing that would have made it more awesome. 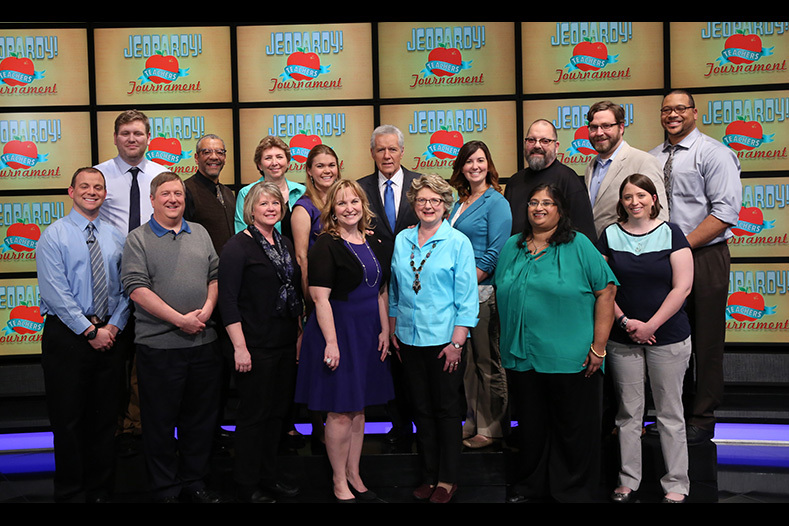 We had students, pizza, a giant prop check from Farmers Insurance Thank America’s Teachers, people from Jeopardy!, a local Farmers agent handing out prizes at commercial breaks, and–fantastic surprise!–Jimmy from the Clue Crew. We also invited people to play along and pledge money for their correct answers to the Friends of Kayany, a U.S. group that supports the Kayany Foundation in its efforts to provide education and nutrition to Syrian refugee children living in Informal Tented Settlements in Lebanon. It was really fun to watch the students and staff play along and cheer one another’s correct answers. And we raised over $2000! Often used to describe artists ahead of their time, it was also the name of a youth militia in WWII Vichy France. As so often happens, getting this one wasn’t really about knowledge, more about parsing the question correctly and making a lucky connection. Everyone I know who didn’t get this nevertheless knew the term, including Lindsey (who put ingénue, a much more resourceful guess than I would have been able to make if it hadn’t come to me). But both Michael and I put avant-garde; I won the game, but he boosted his score to $14,800 and in the end we both made it to the semifinals. I play Tuesday, he on Wednesday. Well, tomorrow is the big day! I play Michael, a Spanish teacher from Chicago, and Lindsey, a first-grade teacher from Waco, Texas, in the Thursday game. Which means we taped after lunch (since all five quarterfinal games were shot on one day), and were sequestered in the green room so that we didn’t know what the score to beat for a wild-card slot would be. After Wednesday’s game, Sara, Eduardo, Graham, and Cody are still in the running, and the score to beat is Cody’s $6,800–but we didn’t know that. The morning movie this time was Planes, Trains, and Automobiles, which I always thought I hated–what’s entertaining about a frustrating series of travel delays?–but which turns out to be a sensitively acted and really very touching movie which I guess I just didn’t appreciate as a college sophomore. 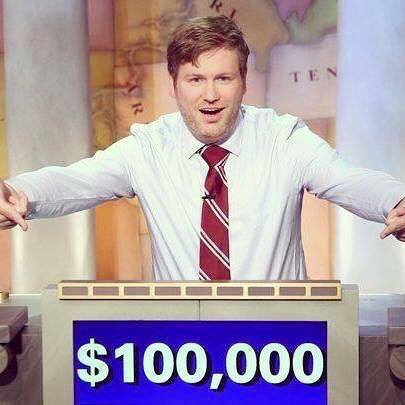 Everyone who goes on Jeopardy! knows enough to win. I understood this intellectually, but for some reason it hadn’t completely sunk in until I watched Lisa play and look for all the world as if she was having fun. Yes, there are players who seem to know everything, but no one knows everything, and everyone has scored pretty high on the same challenging test. If you look at the statistics on The Jeopardy! Fan, you’ll see that often all three contestants have answered nearly the same number of questions. people say, and those people have a point. (This explains how the buzzer works and why the race is not always to the swift.) Some games, all three players manage to ring in about a third of the time. Some games, one player seems to have the rhythm, or has it and then loses it, or doesn’t have it and then manages to pick it up. It’s the buzzer, but it’s also which question values you manage to ring in on. This is stunningly obvious, but the question values double as you go down the board, from $100 to $200 to $400–if I answer the first two questions in a category, and you answer the third, you are $100 ahead of me while answering fewer questions. The buzzer, the question values, and the wagering introduce elements of uncertainty that are hard to appreciate from home, or at least they were for me. I’m not sure why this made me feel a little bit calmer. I think it comes down to finally being able to accept that I could win or lose and understanding at a gut level that either outcome would be fine–which, as I’ve said, I wasn’t ready to believe when I first tried out for the show. Neither outcome would be a referendum on my intelligence, my preparation, or anything else about me. These are bright, curious, interested people, a few of the millions who enjoy playing along with Jeopardy! at home. Press a little and it turns out that they’re thinking along the same lines I was fifteen years ago–anxiety about being wrong in front of other people, the fear of looking stupid, the terror of shame. I haven’t left these things behind, but I’m a middle-aged woman now, and I suppose I’ve had enough experiences of being sorry about letting fears hold me back from something I wanted to do. Also, I’m a teacher. I risk looking like a fool all the time. I also want to model for my students openness and bravery and the willingness to fail. Also, I’m a poet. I love the questions themselves, as Rilke put it. And I’m used to constantly risking absurdity. I have more thoughts about this, but I will save them until after you see my game. Check your local listings! Also, at our viewing party, we will be asking people to play along and pledge (maybe $1?) for each correct answer to Friends of Kayany, the US nonprofit that supports the Kayany Foundation in providing education to Syrian refugee children living in informal tented settlements in Lebanon. We have a student who has been very involved with this organization. You can learn more at their website. And we’re off! Gail won Monday’s game, but both George and Graham have a shot at a wild card berth. That was a tough Final Jeopardy! question in the category A YEAR OF FIRSTS: Year in which the Dept. of Energy was created, the Indy 500 had its first female driver, and the first President was sworn in under a nickname. I think my thought process would have been “Bill Clinton!–no, it has to be earlier than Bill Clinton–Jimmy Carter? Then why do I know his full name, James Earl Carter? Janet Guthrie. The energy crisis. Definitely seventies”–and that’s about when the time would have run out. There’s not a lot to tell you about the run-up to the 2017 tournament, actually. We all got formally booked in December, and February was Paperwork Month. Sony sent us video cameras to tape ourselves explaining what we planned to do with our Thank America’s Teachers grants, so I also had to get my students and their parents to sign releases for their appearance on that video. (Can’t wait to see what our clip looks like on TV! One of my students, an aspiring filmmaker, served as director/camera operator.) The hotel was the same, except that a life-size figure of Robert Pattinson had been installed opposite the check-in desk as an advertisement for Madame Tussaud’s Wax Museum. I ate dinner alone at the Universal Citywalk Pink’s (my first Pink’s experience, actually) the night before. And didn’t have as much trouble falling asleep. Being an alternate for the Teachers Tournament in February, 2016, had some cool perks. Like the 15 tournament contestants, I would stay in a hotel at the show’s expense (unlike regular contestants, who travel to and stay in LA on their own dime), ride a shuttle to the Sony studios in Culver City, and be present as the five quarterfinal games were filmed on one day. The second week of shows–the three semifinal games and the two finals–would be taped on a second day in Washington, D.C., in early April, and the ten games would air consecutively in early May. I would receive a per diem allowance and, if I wasn’t needed to play, a small thank-you check. My school was great about giving me the time off, counting it as a professional absence, and people were very supportive. I completed several multiple-page forms (release form, tax forms, teacher information form, a form where you list five fun stories that Alex could ask you about), scanned and emailed them back, and kept studying. I knew that the overwhelming likelihood was that I wouldn’t play, but I made sure to schedule brunch the weekend before with Gillian, Chris, and Lisa to get their advice–Chris and Lisa because they’d been on the show, of course, and Gillian because we’ve been friends for 30 years, she watches the show regularly, and she gives great advice! We went over wagering strategy and Chris and Lisa gave me some what-to-expect tips. I learned that even as an alternate, I’d get to step up to the podium and practice ringing in during rehearsal. The tournament hotel was the Universal Hilton, which is nowhere near Sony Studios, but it was a thoughtful choice because it’s one place in LA that you can stay and actually walk to a major attraction (Universal Studios and the Wizarding World of Harry Potter). Matt took me there the afternoon before and we walked over to Universal Citywalk, a theme-park-ish outdoor mall, where we spent part of the per-diem check on dinner at Bubba Gump Shrimp Co., a place I had never eaten before or have since. The contestant coordinators/contestant producers are fantastic. Maggie in particular is a human amphetamine, and her epic hour-plus pre-game pep talk is sufficiently energizing that it would not be out of place on an episode of Hard Knocks. —L.V. Lopez, on Frontier Psychiatrist. I’ve been looking for this one story which does a particularly great job of describing how Maggie, in particular, takes a bunch of slightly-to-severely-inward nerds and makes them TV-ready, but I haven’t been able to find it. I just want to add that they–in our case, Maggie, Corina, Glenn, and Aimee–really seemed to get that for each contestant, a day on Jeopardy! is a peak experience, and they never seemed to let on that for them it is a job and maybe someone on staff is being annoying and maybe they’re worried about something outside of work and maybe the coffee was bad that morning. They were like Bruce Springsteen giving his all to Akron, Ohio–“Howyadoin, Akron!” like there’s no place he’d rather be. 2. The atmosphere is camaraderie, not competition. I had my eye on Ian, a social studies teacher from the Valley (here on the far right of the back row), because he had been the previous year’s alternate, and I was hypothesizing (hopefully) that he would have an edge as a returning contestant. We chatted a little and he did seem very calm. It turned out that he taught at the same charter school as one of my former colleagues. 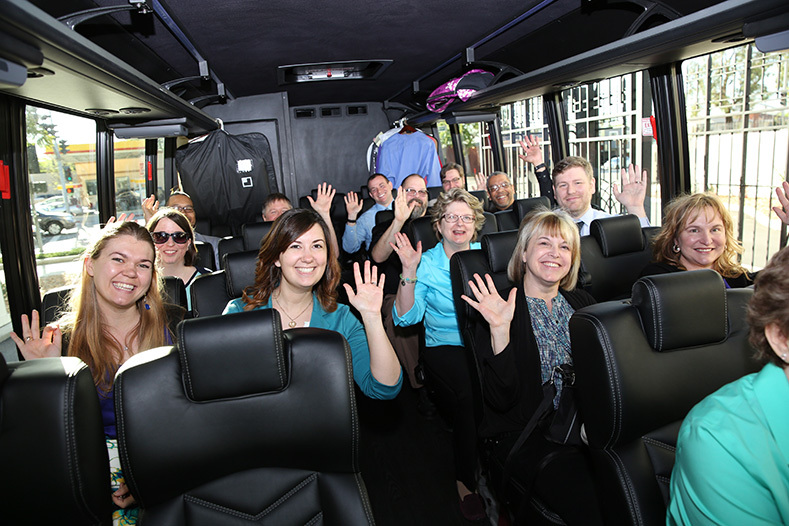 Another, geographically weirder coincidence: Hannah, a math teacher (on the far right of the front row), had attended a summer institute the previous year with one of my current colleagues. Terrie, in light blue in front of Alex, taught social studies in Maryland, my home state, and lived in Pennsylvania not far from Gettysburg, where I taught for a year. And Cory from Connecticut, in the front row, far left, had an MFA in fiction and, like me, would attend the Associated Writing Programs conference in D.C. the following year. I should mention that not all Jeopardy! contestants really are inward nerds. Some of us are extrovert nerds. It’s definitely a teacher type, and one example is Jason, in the back row, upper left. Of course, that didn’t happen until April, and I had to wait until the episodes aired in May to find out most of what happened that day. 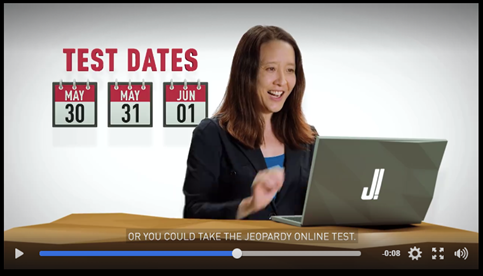 Unlike regular Jeopardy! contestants, who get to watch games from the audience, tournament contestants are sequestered in the greenroom on the first day until it’s their turn to play. The reason for this is that not only do the winners of the quarterfinal games advance to the semifinals, so do the four highest-scoring non-winners. To know the scores preceding your game would be an unfair advantage to those who play later, so they’re kept separate. As an alternate, I would stay in the greenroom until the last three quarterfinalists went onstage, watching movies with the sound turned up so that we couldn’t hear anything revealing from the stage. First, though, we were instructed to turn off our cell phones and sent three at a time into makeup while Maggie continued our briefing. She had already, facing backwards on the bus as the driver, Ernie, negotiated a picturesque surface-streets route through Hollywood and the Fairfax district to Culver City, briefed us on the day and on many of the niceties of gameplay, including the rules about what constitutes a complete, correct or incorrect answer; how to give an answer if you’re not sure of the pronunciation (enunciate every letter); and how to write down your Final Jeopardy! answer if you’re not sure of the spelling (represent every sound). She’d also told a number of stories about tricky rulings and favorite contestants and made us laugh a lot. Now she and a representative from an outside auditor explained that we had the right to contest a ruling if we thought we’d given the right answer and how to do it (at the next commercial break). 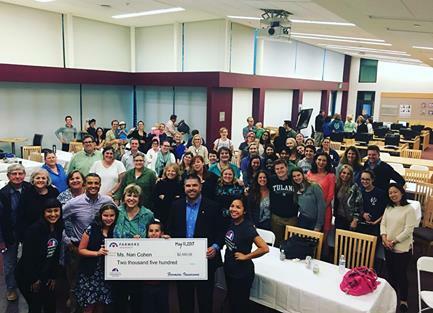 We also met representatives from Farmers Insurance’s Thank America’s Teachers program, which gave $2500 grants to each contestant for use at their schools. Finally, we trooped out to the set to get briefed on how the light pens and buzzers work, to practice writing our names, and to ring in on a mock game in which Glenn played Alex Trebek and the questions were easy, although not so easy that we didn’t get some wrong. My first successful ringing-in was in the category NURSERY RHYMES. The clue, about “Hey Diddle Diddle,” was something like “This ran away with the spoon,” and I said, “What is the fiddle?” instead of “What is the dish?” Fortunately, they let you practice until you’ve rung in and answered successfully a few times. Here are some of the things I remember from standing on the stage: People tell you that it’s smaller than it looks on TV, but it was bigger than I expected and the board was farther away. The buzzer is also larger than I expected and I was most comfortable holding it with two hands. (There are many schools of thought on how to hold the buzzer.) Contestants stand on platforms that can be raised and lowered so that everyone’s head is at about the same level regardless of their actual height, and the stage personnel are very concerned that you’ll forget you’re on a platform and fall off, so you get helped down like a Victorian lady descending from her carriage, even if you’re only six inches off the floor. (Usually right after the extremely calm and kind microphone technician stops you from walking away still attached to the podium by your rehearsal microphone wire.) Finally, it’s chilly in the studio so that you remain cool and dry. If you ever watch from the audience, bring a sweater. Families and friends had been told to arrive at 11:15. Matt came to watch, and so did Chris and her sister, T. Chris was also looking forward to seeing Maggie, who had already reminisced with me about Chris’s previous appearances on the show and the Tournament of Champions. Contestants aren’t supposed to make contact with their families and friends, so they herded us back to the greenroom and let us know that the first three contestants would be Lauren, Dianne, and Chris. Those three got mics attached (cordless this time, connected to a waist pack by a wire that runs down the back of your shirt–this is why you should not wear a one-piece dress on Jeopardy! ), makeup touched up, and a huge round of applause from the rest of us as they headed out to the set. Aimee quickly distracted us like a babysitter with a bunch of preschoolers by pulling out a stack of DVDs, and we settled in to watch The Princess Bride, enlivened–or ruined, depending on your perspective–by her caustic commentary. (I have to agree, Buttercup really is a pretty lousy girlfriend.) We chatted, snacked, made many visits to the bathroom (there are two). I peeked into the flimsy partitioned-off changing area where, on a normal tape day, the winner changes clothes to preserve the illusion that a day has gone by between games. (It’s usually more like ten minutes.) There’s a star on the door that says “Jeopardy! Champion,” but inside it’s basically a closet with a chair. Somehow, the morning went by. Greg, Jason, and Nicole were whisked away for game two, then Jill, Hannah, and Ian for game three. Lunch was brought in for the remaining six contestants, our custodian Aimee, and me. The pizza and sandwiches were good, but I was a little disappointed not to get to go to the Sony commissary, which figures in so many contestant narratives. Aimee put in a new movie–Iron Man, which was much funnier than I expected–and Maggie came to fetch Pete, Tenaya, and Terrie. So the final group, and the only one I would get to watch, would be Kaberi, Cory, and Bill. Once they were standing behind their podiums, Corina sent me into the audience to sit with the rest of the contestants. Chris, Jason, Jill, and Pete had won their games and would be semifinalists; so would Lauren and Nicole, with scores of $11,000 and $5,000. The scores for the two runners-up to beat were Terrie’s $1,300 and Tenaya’s $600, but of course Kaberi, Cory, and Bill didn’t know that. Tournament cut-off scores have varied wildly–Keith Williams has a 2015 chart on his blog, The Final Wager, that shows cut-offs between $4,000 and $18,000 since Season 21–and while it’s rational to aim for $10,000 to $12,000, like so many other things on Jeopardy!, you just can’t know. I’d actually been in a Jeopardy! audience once before–I’d gone over spring break the previous year, reserving free tickets online for me, my daughter and one of her friends. I’d taken the online test and wanted to see what the taping was like. So sitting in the audience was familiar, except that now I was watching people I’d spent the whole day with. I knew that Kaberi had fallen in love with the Spanish language on a junior year abroad in Spain and taught bilingual kindergarten in Chicago. I knew about Cory’s young son and Bill’s special-education students. I wasn’t rooting for any one of them more than the others–I just wanted them all to play well and have fun. As it turned out, they did. Going into Final Jeopardy! (category: AUTHORS), Kaberi and Cory were neck and neck at $8,600 and $8,400, but Bill led them both with $13,600. We all went up onstage and took pictures and milled around. The semifinalists did interviews for the show’s website. (All those promos are still here.) Maggie made sure I took a photo with Alex. “Would you want to come back for next year’s tournament?” she asked. “If I have a choice, yes!” I said. Matt and I went out to dinner with Chris and T before driving back over the hill to collect my stuff from the hotel, and they filled me in on some of the excitements of the games I missed, which I’d have to wait until May to watch. And then I went back to school, picked up the threads of the semester, and kept going with the usual–teaching, writing, and studying for Jeopardy!. Nothing more would happen, I was pretty sure, until the beginning of the next season, at least. This blouse is really too busy for TV, I discovered the following year.